Don lightweight earrings that make a statement but feel like you’re not wearing anything at all. 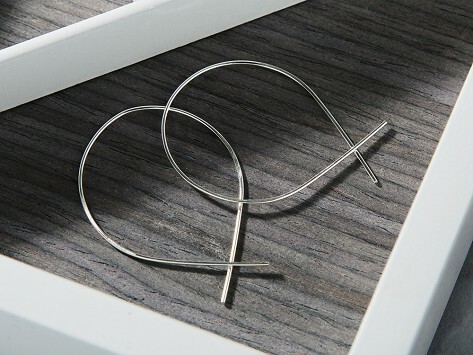 Made from ultra-thin sterling silver or 14k gold wire, these fish-inspired earrings thread through for extra comfort and have a minimalist design that works day and night. Dimensions: 1.75" x 1.5" x 0.00125"
Really light and just right! These are perfect pretty much anywhere!! She loved them!! Light weight and different. Another hit from Grommet. These earrings were my niece's favorite holiday gift this year. She adores them. She adores the pink gold. April Soderstrom’s signature lightweight earrings had so much buzz around them, we had to try them out ourselves—and once we did, we didn’t want to take them off. This worked out well because the Featherlight collection is so comfortable you can go all day and into night without your ears feeling weighed down. April already had a following for her stage-ready pageant jewelry and was a hoop earring lover herself. What she didn't love was when they pulled and got in the way. So she created her own delicate and modern take. The post-less earrings thread through earring holes and are all made in Boston with ultra-thin sterling silver or 14k gold wire. They have a minimalist feel that works with just about any look and are sure to turn heads just like ours did.